Mantras are known as the words of power. Each mantra therefore, creates a certain effect on the human system as well as the environment. OM Mani Padme Hum is one of the very powerful mantras to bring peace, compassion, mercy and love. 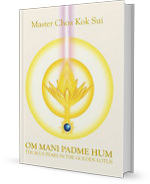 OM Mani Padme Hum workshop reveals the practical applications of this well-known mantra including the chanting for purification of the chakras, invoking Buddha Quan Yin’s blessings, fulfilling of wishes and becoming an instrument of world peace. OM Mani Padme Hum is the mantra of compassion and mercy. If you have a busy schedule and you need peace and love, if you are emotionally disturbed and you need emotional healing, if you want to help your fellow men by becoming a channel of world peace, OM Mani Padme Hum workshop is for you.